If you don’t yet have a chatbot on Messenger, you really should. And you could have one in a matter of minutes. Creating and launching chatbots is no longer a task for coders and software engineers, all that hard work has been done and now, with simple, intuitive tools, everyone can make a chatbot. Firstly, register on our website. Then create your first chatbot. Even a simple one — that says hello and provides five or six interactions and then waves goodbye — is worth having. It means you are giving an immediate response, 24/7, to people who are contacting you. Importantly, when someone chats with your bot, they agree that Facebook can share their name, gender, timezone, image and language. This means that your communication with the user is far more personal and friendly, than, say, if you had tried to reach out to a group email. And one of the truly advantageous features of chatbots compared to designing an App is that you can add new layers of conversation at any time. So go ahead and launch your first chatbot, you can make it more and more sophisticated in the weeks to come. In our next post, for example, we’ll explain how to add some useful functions to your chatbot, like how to broadcast an invitation to chat to your contacts and how to let the chatbot process payments. 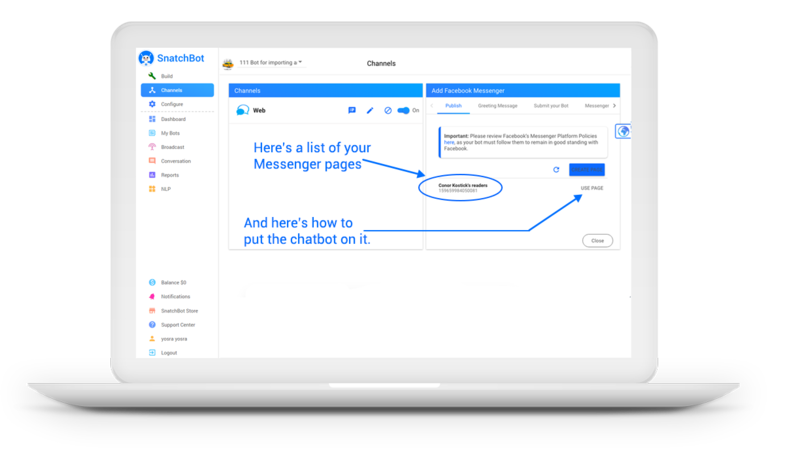 For now, though, the main point is to emphasize that is really is easy to put a chatbot on your Messenger page. Make sure you are logged in to the Messenger account that has the page you want to place the chatbot on. Then click the Channels button followed by the + sign beside Facebook Messenger. Then, a new pop-up opens automatically and you will see your Messenger pages listed (or, if you don’t have one, you can create one now from here by clicking CREATE PAGE). Click USE PAGE. 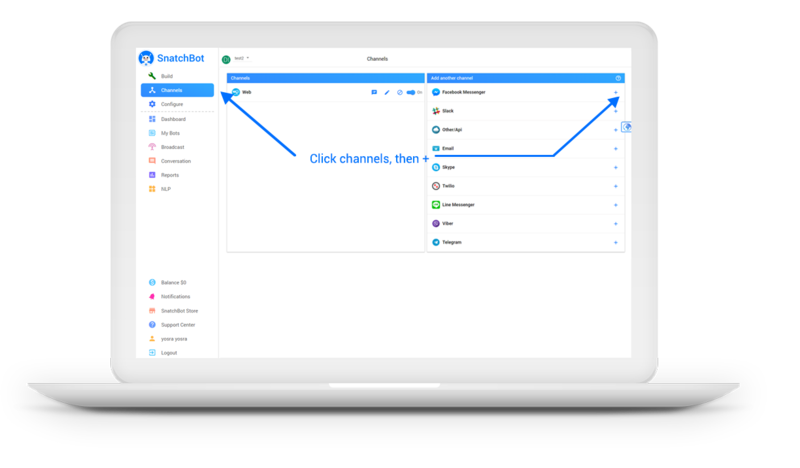 You’ll see a success message and a new entry to your list of channels on which the chatbot appears. 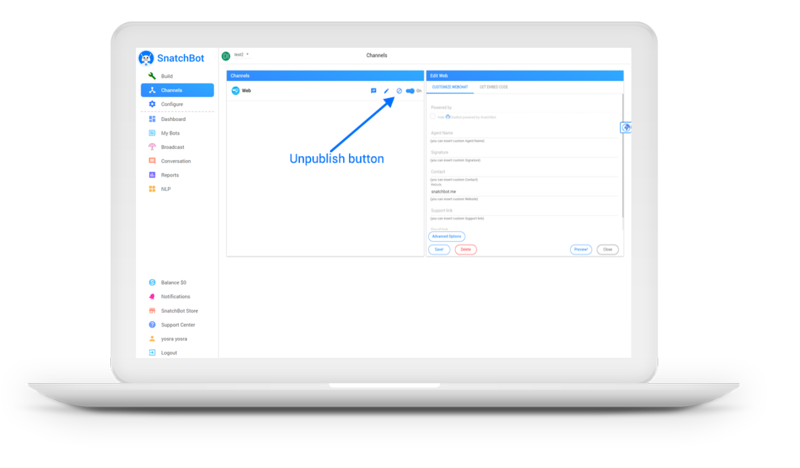 This is where you can switch the bot off and on, or unpublished it. It’s a nice, friendly touch to address the user by name in the greeting. You automatically have that name because the user will be logged into Facebook Messenger. We have written a default greeting for you that does this with the user’s first name. You can adjust the wording, of course (just click on the text and edit it), and decide to use his or her surname or full name instead. Hopefully, you’ve seen that we are not exaggerating when we say that you can make your own Messenger chatbot and do so in minutes. Have a go at it! Not only are chatbots immensely valuable in business terms, but now that the difficulties of creating them have been surmounted, they are fun too. Best of all, here at SnatchBot, we provide our platform and support for free. Free, not just to create the chatbot, but free and unrestricted in how you use it. If you can generation millions of interactions with your chatbot, well, good for you, we won’t ever charge you for them!